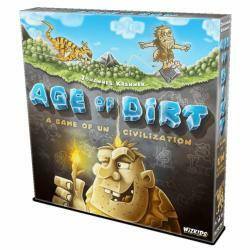 In October, WizKids will release the stone-age-themed Age of Dirt: A Game of Uncivilization. Age of Dirt challenges players to manage their pool of workers to generate resources so they can grow and expand their stone-age civilizations. Much like other worker placement style games, they deploy their workers to gather such things as wood or fur or to create additional workers then use those resources to expand their caves, arm their workers, and purchase inventions. The first player to gather 10 points worth of inventions wins the game. The twist in Age of Dirt is that the workers are not always reliable, and may fail to complete their tasks or even end up doing something completely unplanned. When workers are sent to complete a task, they are added to �The Passage,� a mountain-shaped dice tower-like structure designed to randomize which worker cubes emerge and which get stuck inside. Thus, a worker sent to the forest might emerge in the forest or wait in the Passage to emerge at a later time or in a different location. Age of Dirt was designed by Johannes Krenner (Junta: The Card Game, Romisch Pokern). The game includes the Passage, 1 reserve board, 4 location boxes, 5 player boards, 35 worker cubes, 2 predator cubes, 101 cards, resource tokens, and a drum stick. It is intended for 2 to 5 players, ages 14 and up, and takes about 45 minutes to play.